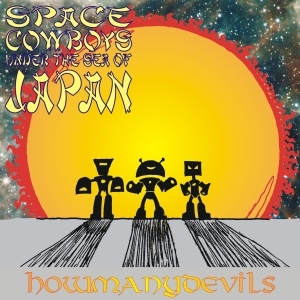 Our third album, Space Cowboys Under The Sea Of Japan was released to the unsuspecting world on December 7th, 2015. Previously grunge/alt-rock, we expanded our sound with the creation of CowProg-SpaceFunk for these songs. Where, I hear you ask, can you get this wonderful music? Spotify, iTunes, Google Play, Microsoft, Amazon, eMusic, Tidal, SoundCloud, and probably some other places. For the last few years. Since we reformed after our 13 year gap to record the 13EP (SoundCloud), with Dark Moon – the missing 13th track from the first album. We’ve tried to release the new stuff we’ve done on Friday the 13th. I missed the target this year (hands up, it was me). I could probably have done it, but wasn’t paying attention. Space Cowboys Under The Sea Of Japan will be out in December. You can stream it now from SoundCloud though. Flesh Reunion, the last album, is in the stores. Amazon, iTunes, Google Play, or Spotify. We’ve already mentioned the 13EP, before that was the long ‘hiatus’ as musicians call it, and before that was HowManyDevils1 (on SoundCloud). We’re onto the last track. Clementine. One of my favourite tracks on this album. A story of revenge, and cowboy type stuff again. With a laser. One of those tracks that we could keep adding and adding to to make it an epic multi part master piece, but is best left as is. A simple tune and story telling lyrics. I recorded my little guitar part for the end separately at home. The rest of the song was all done at Pete’s. I think the vocals fit pretty well in this tune and it has a definite style about it. If we were getting a mini set together this would be one of the tracks I’d pick. This and I Heard You Calling. Maybe cowboy grunge rock funk is our new style? Maybe it’s going to be the next big thing? Maybe we’re ahead of our time?! Maybe the next album will be totally different? Who knows? Corrupted Tranquility. That’s the next track. It’s another song of two halves. First half is funky-tron. Second half is still funky actually, but also a bit more rocky perhaps? Personally I found this one the hardest to sing. We tried so many different singing styles (15 I think) and Rob chose the best for the final mix. I think it has come out well. The original idea came about from a little funk riff I played to Pete and Rob and it grew from there. The chorus sounds mellow and sublime. Again, bass matches the song 100%. The vocals for the 2nd half were improvised from reading unused words from ‘the pile’. I love the effects on the vocal at the end slowly building distortion. The ‘bit crunch’ on the drums brings everything to a head. Lovely build up. Everything works AND we use disgruntled, twice. …is the title of the next track. A little story of an unknown force waiting in the depths of the ocean to unleash its power upon the world. This is probably the most rock type track we have written. Very powerful. Very strong melody hooks. Brilliantly written and played solo section. Solid bass lines that lead and enhance the songs flow. I tried to write some lyrics to match the powerful style of the song and I think I managed. I can’t remember what gear I used on this. Probably the Gallan Strat style guitar. Certainly the analogue phase and over drive. I think the vocals we used were the second maybe third take? I know the style changed slightly from the original recording. Whilst I was recording the vocals on the final mixes of these tracks I was trying to be mindful of my breathing. Listening back I think it helped project the words clearly and added to the power of the sound of them in general. The drums slide along nicely and the marching type pattern for the verses contrasts the slowed rhythm of the chorus.